1Allegiance Consulting, Inc., contractor to the U.S. Geological Survey. The Pressure Water Level Data Logger manufactured by Infinities USA, Inc., was evaluated by the U.S. Geological Survey (USGS) Hydrologic Instrumentation Facility for conformance with the manufacturer’s stated accuracy specifications for measuring pressure throughout the device’s operating temperature range and with the USGS accuracy requirements for water-level measurements. The Pressure Water Level Data Logger (Infinities Logger) is a submersible, sealed, water-level sensing device with an operating pressure range of 0 to 11.5 feet of water over a temperature range of −18 to 49 degrees Celsius. For the pressure range tested, the manufacturer’s accuracy specification of 0.1 percent of full scale pressure equals an accuracy of ±0.138 inch of water. Three Infinities Loggers were evaluated, and the testing procedures followed and results obtained are described in this report. On the basis of the test results, the device is poorly compensated for temperature. For the three Infinities Loggers, the mean pressure differences varied from –4.04 to 5.32 inches of water and were not within the manufacturer’s accuracy specification for pressure measurements made within the temperature-compensated range. The device did not meet the manufacturer’s stated accuracy specifications for pressure within its temperature-compensated operating range of –18 to 49 degrees Celsius or the USGS accuracy requirements of no more than 0.12 inch of water (0.01 foot of water) or 0.10 percent of reading, whichever is larger. The USGS accuracy requirements are routinely examined and reported when instruments are evaluated at the Hydrologic Instrumentation Facility. The estimated combined measurement uncertainty for the pressure cycling test was ±0.139 inch of water, and for temperature, the cycling test was ±0.127 inch of water for the three Infinities Loggers. 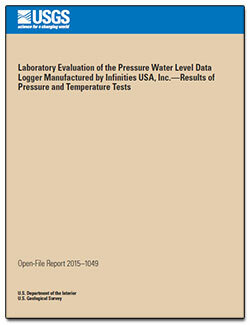 Carnley, M.V., 2015, Laboratory evaluation of the pressure water level data logger manufactured by Infinities USA, Inc.—Results of pressure and temperature tests: U.S. Geological Survey Open-File Report 2015–1049, 14 p., https://dx.doi.org/10.3133/ofr20151049.